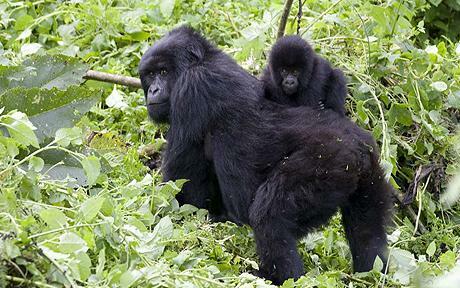 A new baby Mountain Gorilla is born in Bwindi, this is Good news to Uganda’s Tourism Fraternity !! On 22nd/08/2016, the new born gorilla was seen in Busharo area a day after it was born to Bunyindo which is one of the adult female in Bushaho gorilla group. Although the first photos of the baby were dim, it is believed that the baby belongs to Bushaho family which consists of eight members led by the male silver back and naming of the baby gorilla will depend on how it will conduct itself in response to the visitors and its group members. Uganda Wild life Authority (UWA) official and conservationists who have a great conservation concern on deteriorating number of gorillas in Uganda said this was great news for the survival and continuity of the endangered primates in wild. According to the press statement made by the acting area conservation manager John Justice Tibesigwa, he revealed that the birth of this gorilla will increase the population of the mountain gorillas in the area, a development that will enhance Gorilla Tracking in Bwindi Impenetrable Forest. Bwindi impenetrable national park has got 10 groups of habituated mountain gorillas and all are located in different regions. This baby gorilla born under the Bushaho group is located in Nkuringo region in the southern sector of the park and this has been one of the two groups that have been under the habituation process since 2013 and the process is expected to end in 2017. Other habituated groups includes Mubare, Habinyanja, Rushegura group that are located in Buhoma northern part of Bwindi, Mishaya and Nshongi located in Rushanga area and Bitukura group in Ruhija region. All the above groups of habituated gorillas are found in BINP. Over the years, these might mountain gorillas have been threatened by habitant loss, poaching by the people living around the park plus the human activities that are carried out in the forest. Therefore the discovery of the baby gorilla has brought exciting news to the people that have a great concern in conserving these apes in the national park. A number of conservation initiatives that were set up to support the survival of the remaining mountain gorillas have greatly done a big role which clarifies the upturn in the number of these apes since 1980,s from 600 currently to over 880 mountain gorillas worldwide. There has been a census that was carried out by Uganda Wild Life Authority recently and the results are yet to be published. Positive results are highly expected by the conservation initiatives sine there is a proof of the new born gorilla. The mountain gorillas have over the years stood out as the most marketing tourism product in Uganda, said the Public Relations Officer, UTB, Vicent Mugabe. He again talked about gorilla tracking in Bwindi impenetrable forest as being the highlights of all tourists who travel to Uganda. Depending on the number of gorillas, the price for gorilla safari should have a price about $1000 and the great luxury safari should cost between $ 1500 to $ 2000 per person. Almost every single got not less than 72 people travel to Bwindi to track these gorillas and only 8 people are around to track one gorilla family hence meaning there is a maximum number of 80 gorilla permits per day. In Uganda, gorilla permits in months of April, May and November go for $ 450 because it is always a low season and for the rest of the month, gorilla permits go for $600. The American scientists Dian Fossey who spearheaded the campaign about conservation of the mountain gorillas in Rwanda greatly improved the survival of these gorillas .because of her efforts; the mountain gorillas got the first footstep from destruction and death. The movie “Gorillas in the Mist “features Dian Fossey effort in the gorilla highlands.